Most people with asthma will need to use an inhaler to administer medication directly to their lungs. Inhaling your medication speeds up its effectiveness. It goes directly where it is needed instead of being absorbed through the stomach and bloodstream. Inhalers can come in either powder or pressurized form. An Aerosol inhaler consists of a pressurized canister filled with propellant, which has asthma medication suspended in it. When you push down on the canister, a metered dose of asthma drugs will be released. You breathe this in as you push down. Another term for an asthma inhaler is a puffer. 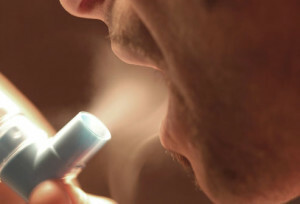 The powder inhalers seem to help some people breathe in the medication more effectively. Some models require you to breath in the medication more quickly than using the pressurized asthma inhaler to get the correct dosage. Work with your doctor to try using several different kinds of asthma inhalers. This will help you find the correct one for you. You may also want to get advice from your asthma educator. You will usually be prescribed two inhalers. You will need to take controller medications, which will treat inflammation in your air passages. These asthma inhalers are taken daily to diminish your asthma symptoms over the long term. You may not notice a change within the first few days, but the controller medication will help prevent asthma attacks. However, they do not work instantly to treat symptoms during an asthma attack. These may include chest tightness, coughing or wheezing. Your other asthma inhaler is a short acting inhaler. These work quickly to relieve asthma symptoms. It can also be called rescue medication. These medications relax the muscles surrounding your airways. Your reliever medication should be used in the event of an asthma attack to treat symptoms such as difficulty breathing. Your reliever may come with a dose counter, which will monitor the number of doses you use. This is a great idea to ensure your asthma inhaler is not empty just when you need it most. You should carry your reliever with you always. 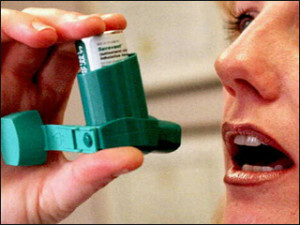 If you need to use your reliever asthma inhaler over four times within one week, you are not controlling your asthma. You should discuss the dosage of your controller medication with your doctor. Some people are told to take reliever medication before exercising. This is fine, and not a cause to change dosages. As with all medication, you may experience side effects. You should talk to your doctor if you feel shaky, have an increased heart rate, or feel jumpy. Children will sometimes display hyperactive behaviour. You should ensure you are using your inhaler properly. It’s important to get help from a doctor or asthma educator. They will show you the best way to get the medication to your lungs as fast as possible. Do not stop using your inhaler. Perhaps your medication is too strong. He may be able to prescribe alternatives. If you are newly diagnosed with asthma, you may need to adjust your dosage. Inhalers may make you feel dizzy or light headed if you use too much. Limit your long acting inhaler to every 12 hours. This usually means taking it every morning and night. If you are using your quick relief inhaler too often it could make you feel shaky and dizzy. Try to limit this medication to moderate or severe asthma attacks. Some people will experience a cough, hoarseness or a sore throat when using a puffer. It’s a good idea to rinse your mouth after using your asthma inhaler. Most asthma inhalers contain corticosteroids. These are natural hormones found in the body already. Levels of corticosteroids used to treat asthma are considered safe. They provide just a small dose of the hormone to reduce inflammation.